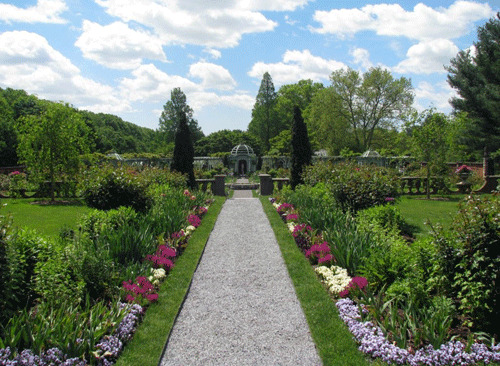 Old Westbury Gardens is nestled amid 200 acres of formal gardens, landscaped grounds, woodlands, ponds and lakes. Westbury House is furnished with fine English antiques and decorative arts from the more than fifty years of the family's residence. Westbury Gardens welcomes visitors of all ages for guided tours of Westbury House and Gardens, in-depth tours of the formal gardens, school visits, children's programs and events, family programs, museum exhibits, classic car shows, indoor and outdoor classical concerts, summer pop concerts, slide lectures, book signings, horticultural demonstrations and workshops, Scottish Games, botanical arts and gardening classes, and Master Gardener and Educator-led Talks & Tours of topics relating to horticulture, art, history, design and architecture.